The traditional process of buying a mattress used to be a very long process, usually taking up your precious weekend going from showroom to showroom with enthusiastic sales staff pestering you. It's not only time consuming but can be very frustrating which is usually the reason why so many people are sleeping on old mattresses which can bring negative effects to the critical parts of your body including your spine and neck. In the last few years, there has been a surge in online mattress-in-a-box companies who have now made this process even easier saving you both time and money. Sleeping Duck is one of these new revolutionary mattress manufacturers; however, because there is quite a large number it can be daunting to know which mattress is the best for you. So, we have created this Sleeping Duck mattress review which will take you through the mattress specifications and performance so you can make a better buying decision. Sleeping Duck was founded in 2014 in Melbourne, Australia and followed a similar story to many start-up businesses. The founders were frustrated with the current mattress buying process which was long, expensive and confusing so decided to create their alternative. The mattress is made by actual engineers who understand the intricacies of creating a product of this complexity. Sometimes having too much choice can make the buying process difficult especially with all the different types of models, firmness, brands and technology. As a result, Sleeping Duck has simplified the whole process by created one flagship product while making incremental improvements based on user feedback. Despite lots of media and investor attention, Sleeping Duck has retained full ownership of the manufacturing process which removes middlemen and overinflated running costs. These savings are then passed onto the end users to create an extremely affordable product. When you purchase the mattress, you’re given two different options of firmness of either medium or firm. Medium is best for side sleepers and firm is more ideal if you sleep on your back. The top bamboo layer is designed to provide air flow and breathability while also being soft and silky to touch. This layer also has the benefit of having natural anti-microbial properties which allow it to remain fresher and cleaner for longer. Natural latex provides firmness and a strong level of support to give you the comfortable sleep you deserve. Because of its firmness, it has a strong bounce back for pressure for whenever you change position. This is vital for your back and neck which need support while you sleep. The latex also promotes airflow and temperature control, so you don’t overheat while you sleep. Memory foam works to contour to the shape of your body while you sleep to relieve pressure points. This leads to improved blood flow and joint relief which works to not only give you a deeper sleep but means you’ll wake up in the morning feeling more refreshed. This layer is constructed using polyurethane foam which is responsible for the firmness of the mattress. The foam used has undergone a rigorous level of testing to ensure that it meets the strong standards for health, durability and emission guidelines. The bottom supporting layer of the mattress has an in-house developed 5 zone support system to relieve pressure along your body as you sleep. The pocket springs each work independently so even if you share a bed with another person you will still get the support and performance that you need. The unique quality of the Sleeping Duck mattress is customisability of the product as you can change the firmness of the mattress by removing the cover and changing the foam layers in the comfort of your own home. The mattress is modular which means that the cover can be unzipped, removed and the pieces swapped in and out. The overall firmness of the mattress is determined by the piece of foam that’s in the top layer. If you’d like to change the firmness of the mattress, Sleeping Duck will send you a replacement piece. It’s as simple as completing a simple online form, and they will be sent out in the post. The mattress also allows you to have different firmness within the different halves of the mattress which is ideal if you are a couple and have different mattress needs so neither of you must compromise. So, when you first select your default firmness, once you have slept on it for a couple of weeks if you’re not happy with the firmness level you can ask for a free swap which can be soft or extra firm. Sleeping Duck do recommend that you trial your first choice of firmness for at least three weeks before requesting a change. So, this is what really matters doesn’t it? The actual performance. The Medium firmness is ideal for side sleepers which require a little more give in the surface. The medium firmness has a slight sink while maintaining lumbar support and tension removing properties. It ensures that you wake feeling well rested. If you’re a back sleeper, then you’ll find that the mattress quickly adjusts to the shape and weight of your spring to provide ample support. This same hugging feeling is also experienced when you move into the stomach sleeping position. This option is better suited for people who mostly sleep on their back or if you regularly suffer from back pain. This firm option has less sinkage so your body won’t dip into the foam as much. Many customer reviews have reported a decrease in back pain that they were previously suffering from before using the mattress. The edge support is very high quality combined with the spring base. This means that even simple tasks like getting out of bed are significantly easier as there is more bounce than traditional memory foam only mattresses. Although the top foam layers will sink when you sit on the edge, the spring base is then activated to stop any extreme sinkage from happening. This means that the mattress can support two people up to a maximum of 140 kilograms each which is impressive. Naturally because it doesn’t contain a spring base, there will be some motion transfer, however, with the top memory foam layers this will reduce this, but this can be tested throughout the trial period. The foam used in the mattress has been approved by GECA and have undergone a rigorous set of testing within accredited and independent laboratories to ensure that it passes the strict standard levels for emissions, durability and content. This means that it’s safe to have in your home. Mattresses are naturally a long term investment which usually lasts on average up to ten years. 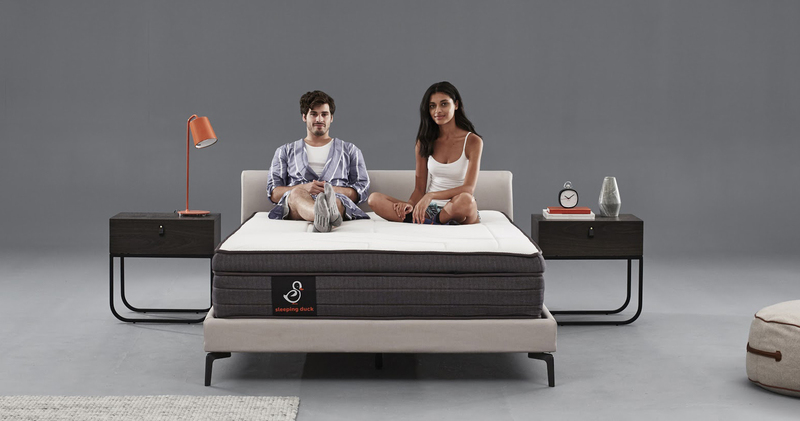 Sleeping Duck have invested a significant amount of money into product development and testing to make sure that the mattress will last the test of time. The mattress and its components have been put through a series of compression tests which ensures that it retains its sinkage and height for a minimum of 3,650 nights of sleep which is then further backed by the ten-year warranty. Ordering a Sleeping Duck mattress couldn’t be easier, just simply by navigating through their website checkout process and the mattress will be sent via courier. The mattresses are packed and compressed in a box using vacuum compression technology. This allows it to be compressed to one-fifth of its typical thickness, and even though the mattress contains a layer of pocket spring, the way the mattress is compressed this doesn’t compromise the overall quality. Once you receive your boxed mattress, you remove it from the box and lay it down into your desired location/room. The mattress will then return to its original size in a maximum of 72 hours, but realistically it just needs 3-4 hours, and you can be sleeping on it. The mattress firmness is customisable whether you like it soft or extra firm or anything in between. The added benefit is also customising each half of the mattress which is extremely handy if you share a bed with someone who has different requirements for yourself. Because of Latex layer which promotes air circulation, this leads to your body temperature to stay regulated throughout your sleep. The inner pocket spring layer also adds further breathability. This means that the traditional problem of memory foam making you overheated isn’t an issue with this mattress. If you can’t quite afford to pay the full price at the point of purchase, then Sleeping Duck does provide financing options which allow you to make repayments in instalments. Once you apply for the finance option, the details are checked against public registers and having good credit history will increase your chances of being accepted. Each mattress comes with a 10-year manufacturer warranty however this has lots added details and isn’t as simple as if the mattress breaks, they’ll send you a new one as the warranty does not cover odours, discolouration and general wear and tear which can be expected after years of owning a mattress. The mattress comes with a 100-night sleep trial which gives more than enough time to trial the product to see if it’s right for you. Within this trial time, you can also request additional firmness levels to make it right for you. The mattress can be used on virtually any flat surface, including the floor. Sprung bases aren’t ideal as the spring system can’t work efficiently on surfaces that don’t provide continuous support. Additionally, a slatted bed base also works well with the mattress to provide additional support while you sleep. You’ll struggle to find a size that doesn’t fit your needs as they stock seven different sizes ranging from single to super king featuring both UK and EU sizing measurements. 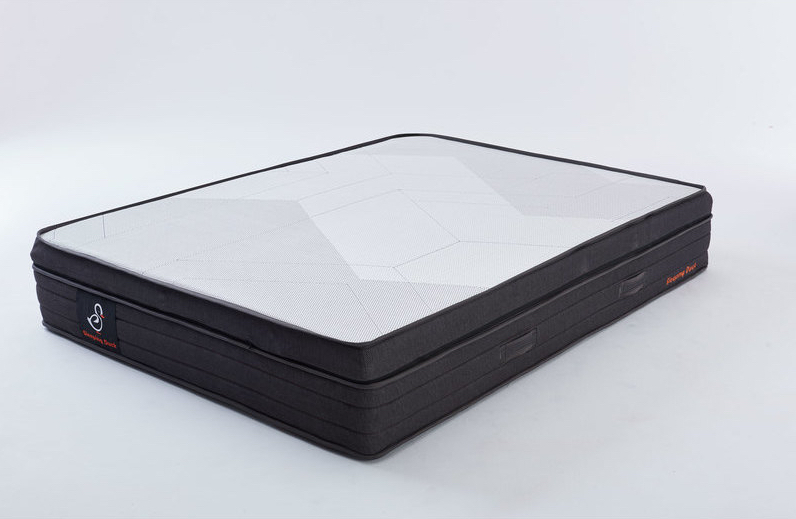 The Sleeping Duck mattress is slightly more affordable than its competitors; however, this is despite its natural materials, a hybrid design and customisable firmness levels. It does mean that although it’s slightly cheaper, you’ll be getting added benefits which contribute to higher quality sleep. Overall this is a top class mattress, and it's custom firmness capability make it perfect if you tend to change your sleeping position throughout the night. This is best suited for back and side sleepers but also if you share a bed and require different levels of firmness for each person. This can also be effective for side sleepers because you can test all the different firmness levels until you reach your desired level of comfortability, which is even more useful with the added 100-night test trial period, so you don’t have anything to lose. The spring and foam layers lead to increased levels of support where you need it most along your spine and neck. It’s honestly difficult to find a bad user review for this mattress which is further evidence to the mattresses overall quality and performance. Want to view the other high rated options? We've showcased them here.